How To Get Your New Website Started in Google? So you've created a great website and want to take it to the skies? To get there, you need to go forward step-by-step without skipping any, because it could cost you a lot of time and effort. Once you have a site up and running, it is now time to fine-tune it and present it to Google. In this post, we'll talk about getting your site in Google, and some of the basic tips from Google Webmaster Academy on optimizing it. If you're a beginner, make sure you've read our previous post(s) before moving on. Part 1: How To Create A Great Website? 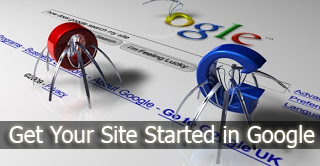 Part 2: How To Get Your New Website Started in Google? One of the first things you should do after creating a site is, check whether it is visible in Google. You can do this by performing a site search on your site, i.e. "site:yoursite.com". You can type this query in Google, and see which of your recent pages are appearing, which will let you know how fast your site is being indexed. If you can't find your site, you must let Google know by submitting a sitemap to Google Webmaster Tools. You can also use the submit your content page to expedite the discovery of your site. Sometimes, Google might intentionally remove your site from its index if it finds your website in violation of its guidelines. Make sure your site is following them before submitting it to Google. It’s good practice to use text instead of images to display important names, content, or links on your site. Google and other search engines focus on text that can be found and read on pages. The words on a page help search engines understand what a page is about and the context in which it might be useful to a potential searcher. If you use images for textual content, consider using the "alt" attribute to include a few words of descriptive text since Googlebot doesn't recognize text contained in images. Also think about the words users would type to find your pages and make sure that your site actually includes those words. As always, check for broken links and correct HTML. Broken links or pages that don’t show up correctly can frustrate visitors to your site. A robots.txt file gives instructions to search engine crawlers about what pages to crawl or not crawl. If you don't have pages that need to be blocked from crawling, you don't need a robots.txt file. We recommend that you use a robots.txt file to prevent crawling of pages that don’t add much value for visitors, such as search results pages or other auto-generated pages. Sometimes webmasters accidentally tell search engines not to crawl their sites with a misconfigured robots.txt file. Make sure this doesn’t happen to your site! You can test if Google can access pages on your site by using the ‘Fetch as Google’ tool or ‘Testing URLs’ in the Blocked URLs section in Webmaster Tools. Browsers sometimes do things differently so you should also test your site in different browsers to make sure that it appears correctly. These guidelines are important if you want your site appearing and ranking well in Google search. The quality guidelines are especially important because they outline some of the illicit practices that could result in your site being removed from Google’s index. Make pages for users, not for search engines: When you make changes to your site, make sure you’re doing so to enhance the user experience, not to try to rank better in search results. A useful question is, "Does this help my users? Would I do this if search engines didn't exist?" Don't deceive your users: Don’t do anything sneaky that your users won’t appreciate, such as automatically redirecting your users to pages or sites they did not intend to visit. Avoid tricks intended to improve search engine rankings: Would you feel comfortable explaining what you've done to a website that competes with you or to a Google employee? Create high quality and original content: see Module 1.3 Create Valuable Content For Your Audience as a refresher.